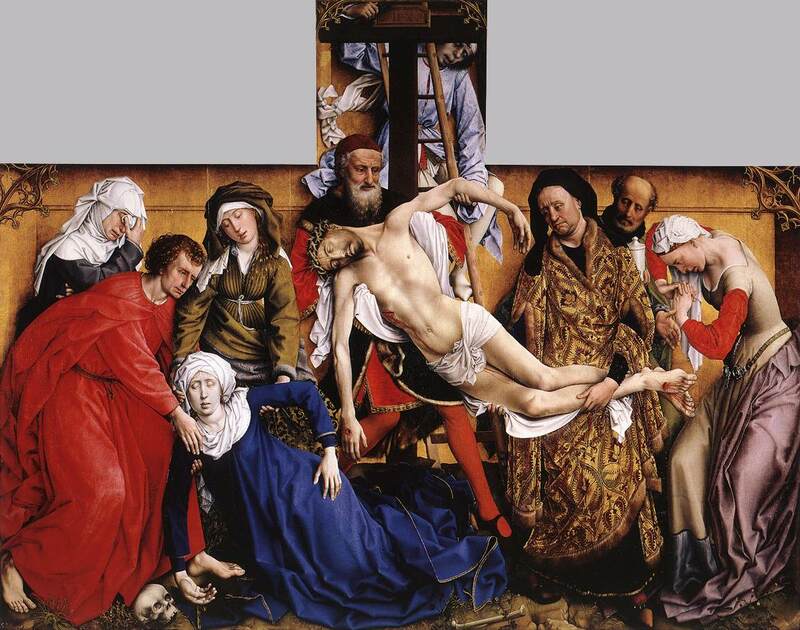 Whenever I want to “wow” my students with the extreme detail of Northern Renaissance painting, I take a few moments to show students some of the amazing details of Rogier van der Weyden’s “Descent from the Cross” altarpiece. 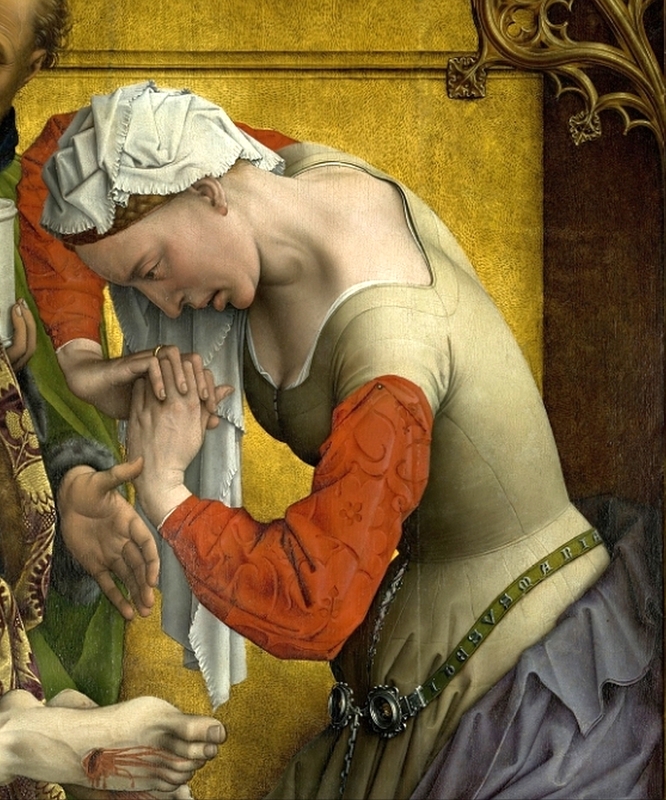 Until this evening, though, I failed to notice a small little detail on Mary Magdalene’s sleeve, near her shoulder: the small pin which attaches her separate red over-sleeve to her dress. In a new book on medieval and Renaissance art, Kim W. Woods argues that this reference to contemporary dress is a carefully constructed detail which would have heightened the sense of reality for a Renaissance viewer.2 That argument makes sense to me. I also think it is appropriate that the Magdalene, of all people, has rushed out of doors without being properly clothed. There are lots of artistic representations of Mary Magdalene in various states of undress; I’m especially reminded of depictions of the repentant Magdalene in the wilderness. I would be surprised to find any of the other Marys (including the Virgin) depicted in their under-dresses at a crucifixion scene. 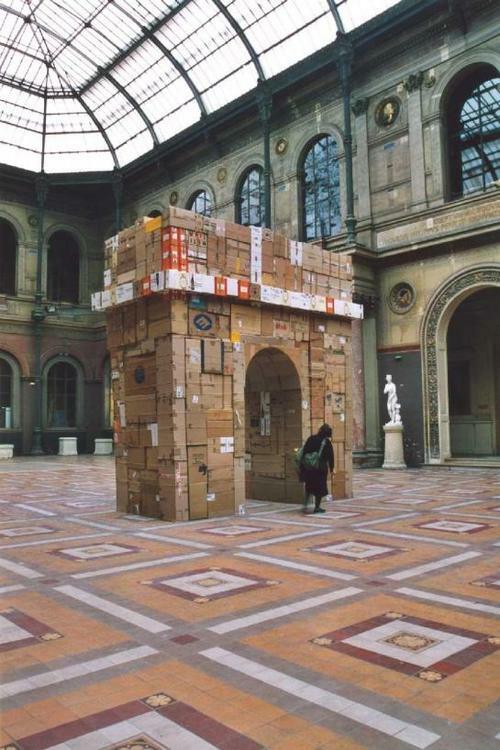 But, when it comes to art, the Magdalene seems to get away with a lot more. 1 Kim W. Woods, ed., “Art and Visual Culture, 1100-1600: Medieval and Renaissance,” (London: Tate Publishing), 37. Many years ago, I got to hear the character Tevye speak those lines several times as I took part in the cast of a Fiddler on the Roof high school production. I grew up watching and participating in a lot of musicals, and I feel like I know a lot of these productions like the back of my hand. 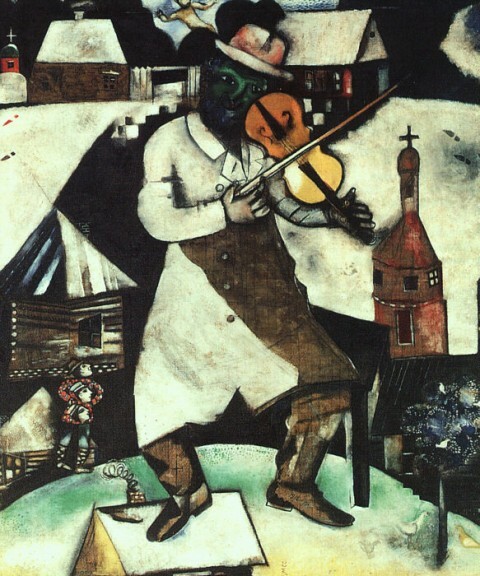 I was surprised to learn recently, though, that the musical title “Fiddler on the Roof” was inspired by Marc Chagall’s work. 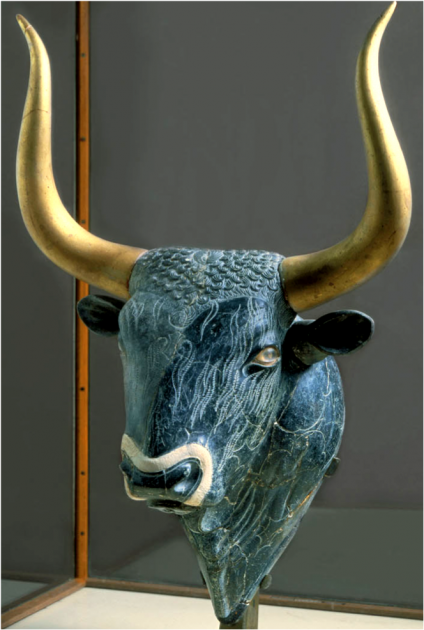 Even the set and original logo were done to evoke the style of Marc Chagall, who was a Russian-Jewish artist. 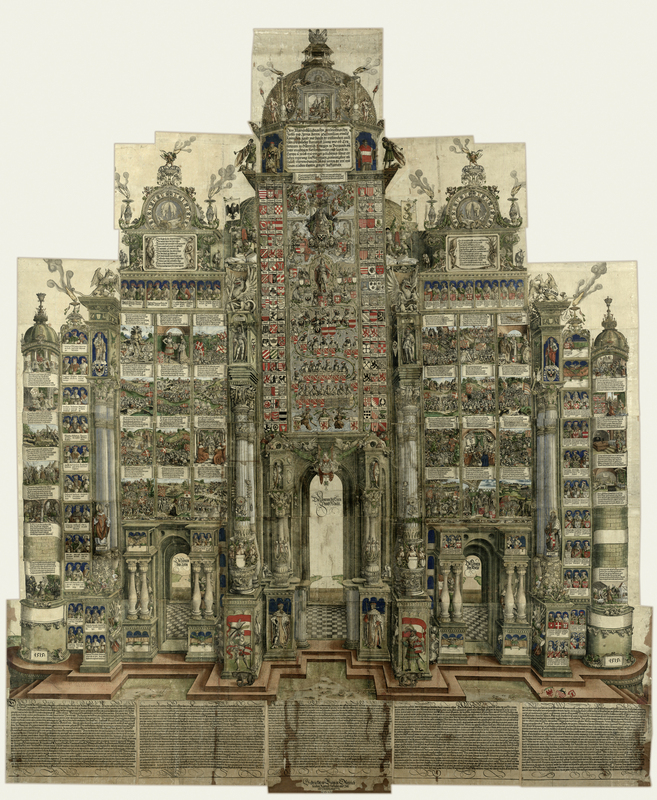 This influence can be seen in an original Broadway windowcard designed by Tom Morrow. The “Fiddler on the Roof” title specifically references a wall painting which Chagall created for the Moscow State Yiddish Theater in 1920. 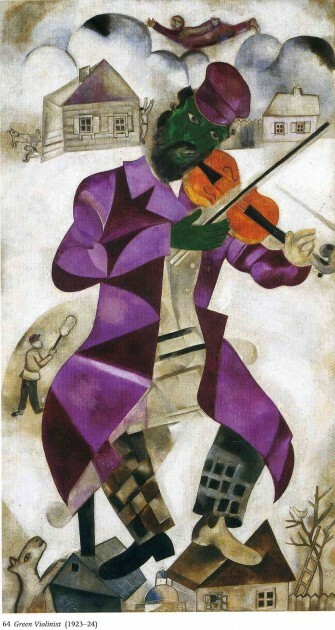 However, we can see that subject matter existed in Chagall’s imagery before this point, as evidenced by the 1912 “Fiddler” painting (the first image included above). Chagall liked the 1920 wall panel so much that he created a later copy, “The Green Violinist” (shown above). As a displaced Russian Jew who lived in France, Chagall often turned to subject matter which evoked the cultural and religious legacy of his homeland. Jennifer Blessing writes, “The Chabad Hasidim of Chagall’s childhood believed it possible to achieve communion with God through music and dance, and the fiddler was a vital presence in ceremonies and festivals.”1 Since there is such an emphasis on “TRADITION!” and following the expectations of God in the “Fiddler on the Roof” musical, I can see how Chagall’s imagery is especially appropriate.